Doesn't this sound like an ad? Arch Clark West, the Mad Men-era marketing executive at Frito Co. whose quirky idea to sprinkle cheesy powder on corn chips led to Doritos, one of the world's great snacks, died last Tuesday at 97. Now, he's taking his chips with him to the salty hereafter. West's daughter tells the Dallas Morning News that the family will sprinkle Doritos at West's funeral this coming Saturday. "We are tossing Doritos chips in before they put the dirt over the urn," she says. "He'll love it." It is no doubt a poignant gesture. But is it inappropriate to point out that this is reminiscent of the less-than-tasteful Super Bowl spot that Doritos aired in February 2010, in which a doofus fakes his death—in order to get his "dying wish" of "a jumbo casket full of Doritos?" 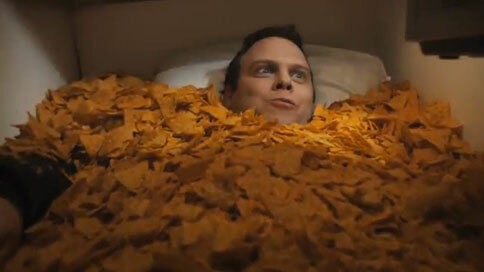 In the ad, the guy is seen munching on the chips in his coffin—that is, until the coffin falls and pops open. With any luck, West's funeral won't feature quite as much slapstick comedy. Via Consumerist.